The countdown begins: One month to “something wearable!” | Sew Lindsay, Sew! Today I pulled up my handy-dandy Joann Fabric & Craft Stores iPhone app and realized I had a coupon for “50% off select classes” expiring tomorrow. There’s a class I’ve been eyeing for awhile, so I took advantage of the opportunity and signed up! 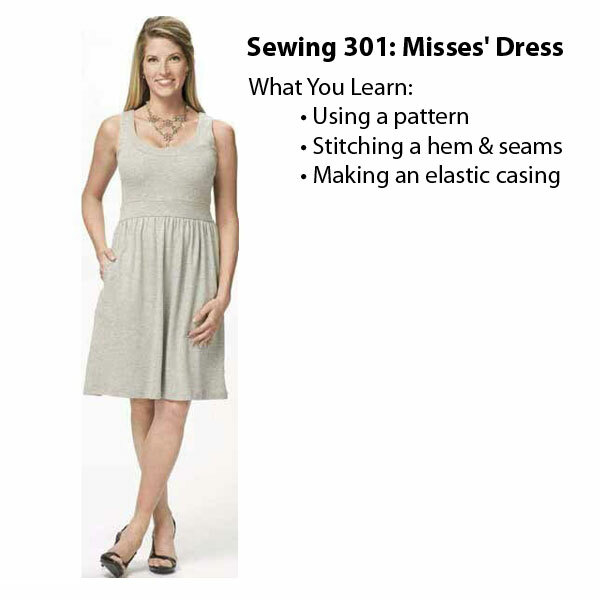 Normally $75 for the two 3-hour sessions, I paid $37.50 for the Sewing 301: Misses’ Dress class. Woohoo! The class isn’t for a whole month though. Sad woohoo. But I’m really hoping to knock my “something wearable” goal off of my 2011 check list. Happy woohoo! This is THE dress I will learn how to make! 1) Has anyone else ever taken a class at JoAnn’s? Was it helpful? 2) The price does not include supplies! Yikes! And here I’d always thought the class prices were a little high because of the supply costs. Apparently not! OK–anyone who says ‘sewing is for old peeple’ can’t sew a lick! My mother was an amazing seamstress, but…as for me…no. I so admire this skill. Am so envious!! Pingback: Scary Stretch Knits & “Something Wearable” Suspense! « Sew, Lindsay, Sew!